Trout, 27, backed up those words Saturday night by refusing to let the 32-year-old Cotto, a four-time champion, catch up with him. Trout (26-0 with 14 knockouts) soundly beat Cotto (37-4, 30 knockouts) in a 12-round unanimous decision before 13,096 spectators, many of them cheering and waving Puerto Rican flags in support of Cotto — a native of Caguas, P.R. — and loudly booing Trout. 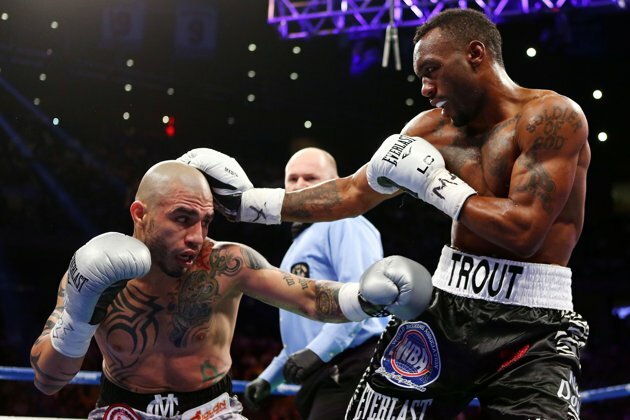 Trout set the tone early by wobbling Cotto with a hard left hand in the first round. Cotto quickly regained his footing and his composure, but the taller and longer-reaching Trout kept Cotto at bay until midway through the sixth round when Cotto connected with a razor-sharp right hand to Trout’s face. But Trout hardly blinked. Trout’s southpaw style gave Cotto trouble throughout, as Cotto had a tough time attempting to square up the champion and attack him with any consistency. “I had to show him I was the bigger guy and push him back a couple of times to show him he had no advantage,” Trout said. Cotto had his greatest success in the closing seconds of the 10th round, backing Trout into his corner with a flurry of punches that dazed Trout and had the crowd cheering. But Trout refused to give Cotto any openings after that. The fans were still cheering for Cotto, who has long made the Garden his second home, having won all seven of his previous fights there. The crowd had been serenading him with chants of “Cott-O, Cott-O” from the time he entered the ring. But none of that fazed Trout, who lives in Las Cruces, N.M., and arrived on Saturday night’s stage by first winning the W.B.A. interim super welterweight world championship in February 2011 by defeating Rigoberto Alvarez. He had since made three successful defenses of his title while fighting in the shadows of Cotto and a crowded stable of marquee welterweights. Though quiet outside the ring, Cotto has spoken loudly with his fists since turning pro in 2001. Along the way, Cotto has earned millions on the strength of his reputation for taking on the toughest fighters of his generation, and Trout was no exception. In recent years, Cotto has been doing battle with a steady stream of marquee opponents, a list that includes Shane Mosley, whom Cotto defeated in 2007 to retain his W.B.A. welterweight crown, and Antonio Margarito, who took that title away from him in 2008. Cotto lost to Manny Pacquiao in a heralded bout in 2009, but met Margarito again last year and defeated him to retain the W.B.A. light-middleweight title. In May, however, Cotto lost his light-middleweight crown to Floyd Mayweather Jr. The Cotto-Trout affair was the main event of a nine-card bout that began with John Thompson, a middleweight from Newark (10-0), defeating Eli Agustama of Port-au-Prince, Haiti (6-6), in a six-round unanimous decision. Eddie Gomez (12-0), a rising super welterweights from the Bronx, dealt Luis Hernandez (9-1) of Rio Piedras, P.R., his first loss as a professional with a six-round unanimous decision. A pair of hard-punching featherweights fought next, with Jorge Diaz (17-1) of New Brunswick, N.J., brawling past Victor Sanchez (3-5-1) of Houston in six rounds to earn a unanimous decision. Another fighter from Newark, a lightweight named Michael Perez (18-1-1), twice dropped Fernando Carcamo (10-5) to the canvas to capture a unanimous decision. Jeffrey Fontanez (9-0), a lightweight from Cotto’s hometown, Caguas, electrified the crowd with a vicious, sweeping left-handed knockout of Pedro Arcos (12-3-1) of Tijuana, Mexico, in the second round of their scheduled six-round bout. The Puerto Rican faithful were back on their feet a short time later as Jorge Melendez (25-2-1) of Manati, P.R., dominated James Winchester (15-7) of Greensboro, N.C. Melendez scored a technical knockout 54 seconds into the fourth round of their scheduled eight-round super welterweight fight. After the Melendez bout, the cheers began to swell for the arrival of Daniel Jacobs, a super middleweight from Brooklyn. Jacobs, nicknamed the Miracle Man, was found to have spinal cancer in May 2011 and was temporarily paralyzed below the waist. Jacobs (24-1) did not disappoint, overcoming a slow start to defeat Chris Fitzpatrick (15-3) of Cleveland by technical knockout at the end of the fifth round. Jayson Velez (20-0), delighted the crowd by capturing the vacant World Boxing Council Silver Featherweight title with a third-round technical knockout of Salvador Sanchez II (30-5-3) of Mexico. NEW YORK -- After most of the fans who flocked to the Garden had left, Austin Trout hopped on the top rope, his championship belt still around his waist, and pointed in appreciation to the ones who stuck around in celebration. Trout had started the night about as unknown as any champ in the sport. Without a doubt, he made a name for himself in New York with the signature victory that had eluded his title reign. Trout roughed up Miguel Cotto late to win a 12-round unanimous decision and retain his share of the 154-pound title Saturday night at Madison Square Garden. Trout remained unbeaten and used lopsided scorecards to end Cotto's run as the undisputed champion of the New York fight scene. "All I wanted was a chance," Trout said. "That's all I asked for." Trout (26-0) grated skin off Cotto's battered face, leaving the challenger red and swollen, after cranking up the pressure over the final two rounds to truly take control on the scorecards. Cotto (37-4) lost his second straight fight after dropping a piece of the 154-pound title to Floyd Mayweather Jr. in May. "I've been preparing for this fight my entire life," he said. "Fighting someone like Miguel Cotto is a dream come true for someone like me waiting for their big moment. I had to show him I was the biggest guy and push him back a couple of times. I kept pushing him back to show he had no advantage there." "I'm not finished yet," he said. "I still have boxing in my mind. I just want to rest with my family the rest of the year." Trout got second billing in the pre-fight introduction, walking out first, a member of his team holding the title belt high over his head -- the intro traditionally reserved for the challenger. But Cotto's company, Miguel Cotto Promotions, helped promote the fight, and he was the main reason why 13,096 fans came to the Garden. They serenaded him with "Cotto! Cotto!" chants as he walked to the ring and they never let up until the end of the 12th round. Trout's trunks read "Keep Up." Did he ever. "They shouldn't have a question who Austin Trout is now," he said. Before the main event started, there was a moment of silence and a 10-bell salute for Hector "Macho" Camacho, who was shot in the face Nov. 20 while sitting in a parked car and died four days later. Jacobs busted open Fitzpatrick's scalp early in the fight and pummeled him in the fifth, forcing the stoppage. "I'm glad I got the rounds in and the ring rust out," Jacobs said. "I feel like I'm back. Obviously, I want to step up my competition. But I don't want to jump the gun just yet." Trout's win came in one of the rare main events these days at the Garden. The Barclays Center has quickly claimed its turf in the New York fight game as Madison Square Garden's days as a fight mecca have dimmed beyond the occasional Cotto fight. Some of the epic heavyweight bouts in history, including the first two Muhammad Ali-Joe Frazier fights, were held in the Garden. The remodeled arena is no longer boxing's regular showcase for the stars.